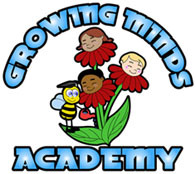 Growing Minds Academy is a non profit organization that exists to improve the lives of children and families across Jacksonville. The mission of Growing Minds Academy is to provide safe, affordable, high quality child care, regardless of income. We exists to provide a safe, developmentally appropriate environment for preschool and school age children. Our focus is to provide a stimulating early care and education experience which promotes each child's social/emotional, physical and cognitive development. Our goal is to support children's desire to be life-long learners. Growing Minds Academy employs highly educated staff one of individuals who demonstrate a natural ability to work well with young children and their families. We provide structured staff development to address individual and program needs through educational opportunities, teamwork and mentoring. We foster each child’s social-emotional growth through the awareness of self and community. We teach children valuable skills like responsibility through gardening, and confidence building through communication and etiquette through numerous field trips. We value classrooms that nurture self-expression, adaptability, respect, caring, and empathy. We assist each child’s learning by understanding development and appropriate practices. Highly qualified staff provides individualized attention; exciting, fun and academically challenging activities; and opportunities to develop school readiness skills. We nurture partnerships with families based on mutual respect and trust. We provide education and support to empower parents in their role in their child’s development. We identify community needs throughout Jacksonville and respond by providing services or aiding program development within the community.